A ruling last week by a Pennsylvania Commonwealth Court judge regarding the consent decree between UPMC and Highmark determined it will remain on schedule to expire June 30, 2019. This is a response to Pennsylvania Attorney General Josh Shapiro filing a petition in February asking the Court to modify the consent decree by extending it between the two Pittsburgh-based companies among other requests. Although this ruling is a slight setback due to the pending timeline, the end of the road has still not been reached. Judge Robert Simpson ruled that the expiration of the agreement is an “unambiguously and material term of the consent decree” as previously decided by the Supreme Court and therefore cannot be changed or extended indefinitely. He also sited that “because the Office of the Attorney General does not plead fraud, accident or mistake, this Court lacks the power or authority to modify the termination date of the consent decree without the consent of the parties, even if it were in the public interest to do so.” However, Judge Simpson did not rule out that a modification of the agreement was off limits – The Attorney General does have the right to seek to alter the consent decree on the terms if it is for the public good. For this reason, Attorney General Shapiro plans to appeal to the Supreme Court in short order with the impending expiration date. Additionally, three of the four issues that the Attorney General took to Commonwealth Court were ruled in Shapiro’s favor and they declined to address UPMC’s other claims such as its assertion that the Attorney General’s office cannot force it to contract with Highmark, unfair trade practices and UPMC’s charitable obligations. While many in the Pittsburgh delegation are thankful that Judge Simpson heard the petition in a timely manner, we are hopeful the same can be said that this matter be brought up before the state’s Supreme Court. In the meantime, Senator Costa’s Senate Bill 310 (SB 310) and Senate Bill 311 (SB 311) are avenues that many have lend their support to. These bills would require health systems to either contract with all health insurers for services or enter mandatory arbitration. This would ensure that all patients can receive care with the specific doctors they want while also guaranteeing residents have access to these doctors at reasonable rates. Once again, I urge my constituents to reach out to the Majority Party and request that it is imperative that these bills be brought up for a vote in the very near future. I encourage anyone looking to learn more about REAL ID to attend an Information Session that Rep. Dan Deasy and I are hosting. The REAL ID Information Session is scheduled for Thursday, April 25 from 6:30 – 8 p.m. at the Crafton Borough Community Center, located at 140 Bradford Avenue. Representatives from PennDOT, Department of Vital Records, Department of Health and Allegheny County Courts will be on hand to answer questions. As I wrote in the March 5 edition of my News & Views, REAL IDs are now available. If you have questions about how to obtain a REAL ID I hope to see you on April 25. The Pennsylvania Gaming Control Board announced recently that revenue generated from slot machines in Pennsylvania increased 2 percent in March compared with March 2018. Revenue from slot machines in March totaled more than $226 million, an increase from last March’s slot machine revenue of just over $221 million. Tax revenue from slot machine play in March totaled more than $118 million. The state’s gaming industry employs about 17,000 people and generates approximately $1.4 billion annually in tax revenue from both slot machines and table games. For more information on gaming in Pennsylvania and to read reports from the Gaming Control Board, please visit them online at www.gamingcontrolboard.pa.gov. Did you know that March’s revenue total was the third highest individual month from the play of slot machines, ranking only behind March 2012 ($233.1 million) and March 2013 ($229.3 million)? new registrants through the process. I want to remind everyone that anyone wishing to vote in the May 21 Primary Election needs to be registered no later than Monday, April 22. 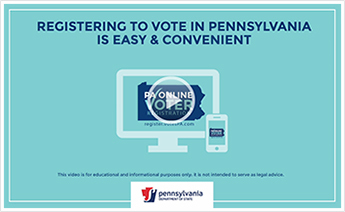 Any additional questions can be directed to the Allegheny County Elections Division at 412-350-4500. The Greater Pittsburgh Hotel Association is hosting a job fair for hotels, restaurants, and transportation companies this Thursday, April 11. The job fair is being held at the Wyndham Grand Hotel in downtown Pittsburgh, located at 600 Commonwealth Place from 11 a.m. – 2 p.m. Speak with representatives in Pittsburgh’s hospitality community and discover employment opportunities. For more information please call 412-292-0980. The Carnegie Volunteer Fire Department is hosting its 12th annual 5K Run/Walk on Saturday, April 27. Registration begins at 6:30 a.m. with the Run/Walk starting at 8 a.m. at the Carnegie Borough Municipal Building, located at One Veterans Way. Registration forms are available at the municipal building or at www.carnegieborough.com. All proceeds from the race benefit the Carnegie Volunteer Fire Department. For more information, please visit www.carnegieborough.com or call 412-276-1414. The Monongahela River gets its name from an American Indian phrase meaning “steep, falling banks.” The “Mon” as it is also known has a mud bottom, as opposed to the Ohio River, which has a stone and gravel bottom.